I have a particular way I work with a standard pen and notebook. With my work I meet with lots of people. I frequently have questions I need answers for, and want to collect them for the next meeting. I also have my own action items, as well as notes I keep for important meetings. So I have a note book that I put lots of little tabs down the side with people’s names, plus reserving larger sections for my own to-do list (which is always too long!) and meeting notes. Paper is also really flexible – I can scribble notes anywhere on the page, do diagrams, write sideways, etc. It is also lighter, and does not run out of battery power. After evaluating several technologies (e.g. iPad, laptop, etc), I stuck with paper and pen – and have been pretty happy. There are however things that for me works badly. I cannot search through my notes. When the book fills, I cannot expand it (I start a new book). I cannot reorganize my notes that well (I have to pick how many pages in advance to allocate to each section). I have a separate list of tasks compared to in OutLook. These are the things I was seeking to overcome. So having just got a Capturx pen with Microsoft OneNote integration, have I solved my problems? To be honest it is too soon to tell, but things are promising. I still have the side tabs stuck onto my book with people’s names written on them. I can still draw diagrams, scribble anyway – have the full flexibility. 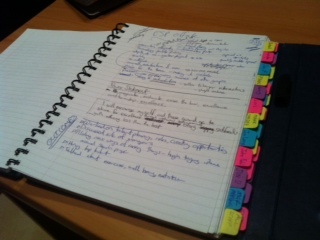 I can still quietly take notes during a meeting (but I do have to watch out for batteries going flat now – in the pen). Microsoft OneNote allows me to search my hand written text. I can tag lines in the book as Outlook tasks – the appear in Outlook, and marking as complete in Outlook or OneNote marks them as done in both. Very nice! You just highlight, then right click and pick “Outlook Task” from the menu. I can tag and highlight hand written text in OneNote. I can search to find notes in OneNote. I can add standard OneNote pages (typed) and intermix them with my written notes. Its easy to mix and match. I am not forced to have digital pages and OneNote pages kept separate. I can use OneNote sections to group pages. If I run out of pages in my physical book, I can use another random page and then in OneNote move that page into the appropriate logical OneNote section. Cool. I showed someone the pen today – they said “I get nervous in any meeting I am in with those LiveScribe pens – I never know if they are recording me”. I answered that concern easily – this pen cannot record them. All up, it feels like a great fit so far. I tried doing little square boxes so I could put a tick mark in them. The hand writing software converted them into letters, which made the converted text not so good at times. For now, I am using a dash in front of each point. I have not found anything indicating I can create TODO items (Outlook tasks) just by writing a special symbol on the page. I have to write the text, sync with OneNote, then in OneNote select each item and right click to convert to a task. I really want to be able to draw a little box, then tick it when done (closing off the task automatically on next sync). All new pages go into the “Imported Pages” section. You have to drag them into the other relevant sections in OneNote that you might want to create. Once there, the pages don’t move again. So if you add to a page, it will just have the new text added. But if you turn the page and write on the next page, it does not get automatically put into the same section as the previous page. Some manual organization of pages is required. So far this has been fine. I almost did not create OneNote sections, just leaving all the pages in the default “Imported Pages” section. You don’t get as much choice about note books. I liked my notebook above. It was spiral bound, so it lays out flat on desk easily, or wraps write around so I can write in my lap easily. It had a hard cover which was also good for when using pad in my lap (e.g. listening to a talk). But most importantly, it had a place to hold a pen inside the cover. (The cover wraps around and has little magnets in it so it clicks closed.) This would be really useful for the pen so I have a single thing to carry to meetings (not a notepad and a pen as separate units. You can print off your own paper – maybe I need to find a ring binder and whole punch and solve it that way. I don’t think the search works quite as well as the LiveScribe pen. I suspect OneNote converts handwriting to text so searches on that converted text, whereas LiveScribe I believe searches on strokes so is more forgiving in searches. If you want multiple notebooks going in parallel, the Capturx pen is a little awkwared. From customer support (which was pretty prompt) “… yes you can have two notebooks in use at once. However, to do this you will need to only write in one notebook, dock your pen, download the ink, then ‘tic’ the New Notebook box of the other notebook you wish to write in. You would need to dock your pen each time you would want to switch notebooks. Checking “New Notebook” on the front page simply allows you to choose which digital notebook you want to download the ink to when you dock the pen whether it is a previously started notebook or a new notebook.” LiveScribe in comparison sells number 1 – 4 books, so you can use any of those in parallel without issue. My verdict so far after a few days? I like the pen. It works seamlessly with Microsoft OneNote. Its very simple. Most of my needs are met. Microsoft OneNote is pretty functional (especially compared to the LiveScribe desktop for example). When I dock the pen, my new notes automatically appear in OneNote – I don’t have to sync to a desktop and then move into OneNote. If I could just create action items or to-do items by just writing on the page without having to mark them up in OneNote then life would be perfect. Hi, I’ve been trying to get the LiveScribe Echo to meet my “todo” list needs for about a week now. I think I’ve completely given up for the same reasons as you have highlighted. After reading your first blog on the switch to the Capturx pen I thought you might have discovered a better solution. Though it looks like it’s a lot simpler to get your data into OneNote, it still doesn’t solve the todo list problem. For me, the key use case is being able to markup a todo item, then subsequently consolidate and organize that data (tag, assign, prioritize, mark done, etc.) I’m actually quite surprised that a pen on the market hasn’t attempted an end to end solution for this. Anyways, thank you for the blog, it was helpful. You are right – neither pen does a great solve of the TODO problem, if you want TODO items in OneNote marked up as such. It has not bugged me that much however in practice – maybe because I am not a power OneNote user. I just cross the items off on paper without having OneNote know that it is a TODO item. What I do in practice is draw a vertical line the height of the text of the TODO item in the left margin a when its finished. I found crossing out text looked ugly – made it harder to read afterwards (and not sure what it does to OneNote searchability of the text). Drawing a line in the left margin meant that I could easily tell when all TODO items on the page are done – the line in the left margin would join up from the top of the page to the bottom with no gaps left. That is, anything without a line in the left margin still has to have work done. I think part of the challenge of a TODO list is you have to first recognize its a TODO list item, but then afterwards if it gets checked on written paper you want to update the checkbox to the “checked” status. How long does the battery in the pen last? If you are on the road for a few days do you have to bring the doc to charge it? It depends on your usage. Personally i would bring a charger. But i would personally also not leave it too long to sync, being afraid of losing too much data.